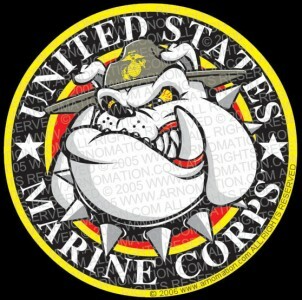 Here’s a USMC Marine Bulldog Logo Design I did a few years ago that’s been very popular. I get a lot of requests to license it for t-shirts and patches for everything from baseball team uniforms, to model airplane stickers and on and on. I got so many requests that I set up a USMC Bulldog Cafe Press Store so people could get coffee mugs and t-shirts and all kinds of other merchandise with the design. This entry was posted in Cartoon Logo & Character Design and tagged cartoon bulldog, Cartoon logo, character design, Chesty, Devil Dog, Semper Fi, USMC Marine Bulldog Logo Design. Bookmark the permalink.